Chubby the Horse’s Birthday party occurred here at the Horse and Hounds in Ocala today. 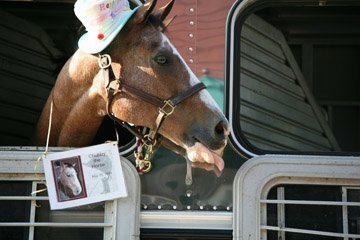 Chuck Waters wanted to buy Chubby a beer for his 21st birthday so he planned a little surprise birthday party for Chubby at the local watering hole. Chubby enjoyed his bucket of Killian’s Red and his special birthday cake. Chubby and Chuckie have been together for 17 years, longer than any of the other 5000 or so horses Chuckie has owned over the years!